In 2018, CUPRA introduced itself as a way of life for those who create the path. CUPRA is more than a new and independent car brand, it is a way of life for those who create the path. 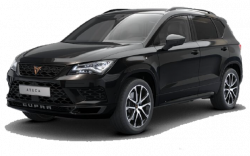 The range starts with the introduction of the CUPRA Ateca, an SUV with the heart of a sports car. It is a driver-centric car that is inspired by the tracks but born for the streets. The CUPRA Ateca comes with 4 Wheel Drive and a technologically advanced engine. Exactly one year later, and to celebrate CUPRA’s first anniversary, the CUPRA Formentor Concept Car was presented at the 2019 Geneva International Motor Show – a challenging hybrid here to redefine performance with electrification; a reinvented driving experience inviting us into a new world where raw materials interact with energy.